If this programme is right for you? Both for experienced trekkers, who have not yet been on this trip, as well as for beginners alike, the Everest Base Camp Trek remains a ‘once in a lifetime dream trip’s to be fulfilled. 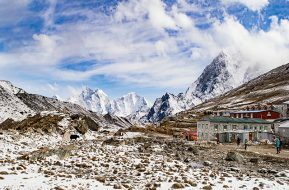 No doubt the Everest Base Camp Trek continues to be the most awesome trekking destinations in the world, not to mention some of the most breathtaking views one encounters during this trek. The Everest Base Camp Trek also introduces you to the lives and culture of the Sherpa community living high near the vicinity of the tallest mountain in the world – The Mount Everest (8,848 m), and who are ardent followers of the Nyingmapa School of Tibetan Buddhism. 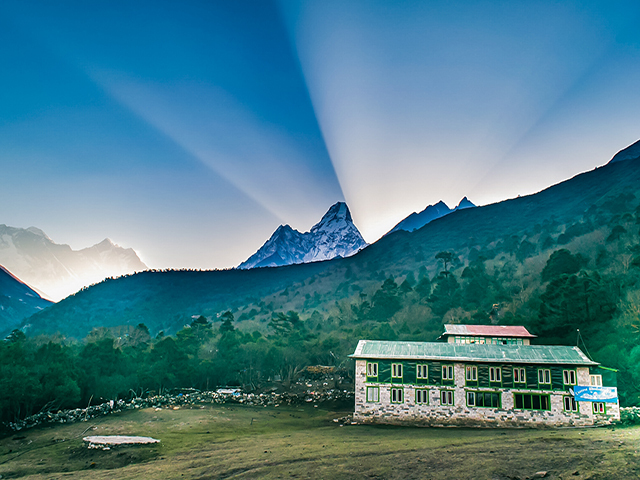 The Khumbu region of Nepal is where the Everest Base Camp Trek trail falls. 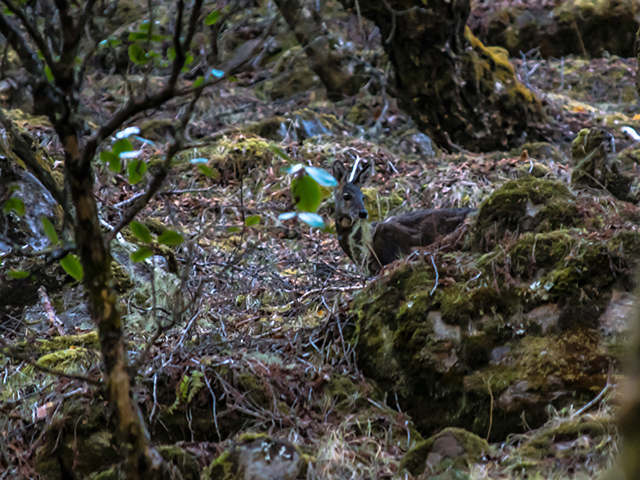 This trek can be approached from many different places around the country but then each approach dictates varied number of days required for this trek. 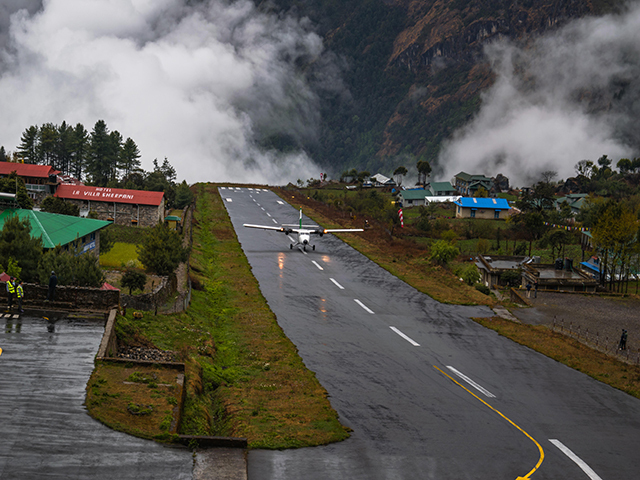 However, the most popular option is to fly in and out of Lukla (2,800 m). This option of the Everest Base Camp Trek commences with an exciting 30 minutes mountain flight to Lukla from where the trek begins, all the while taking you through several Sherpa villages and interesting monasteries until you finally arrive at the Everest Base Camp (5,360 m). You retreat back to Lukla via the same trail and fly back to Kathmandu. The 13 days Everest Base Camp Trek itinerary chalked out below is straight forward but allows the much needed time for acclimatization in between. Kathmandu : Tour of Buddhist Stupa of Swayambhunath, ancient palace of Bhaktapur and Holy Hindu temple of Pashupatinath. 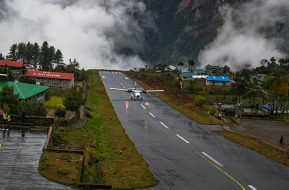 Monjo : Fly 30 minutes to Lukla and trek to Monjo. Dingboche : Another day of acclimatization. Option exploring Chhukung valley. Gorak Shep : Trek – afternoon climb Kala Pathar 5,545m to catch the mesmerizing sunset view over the Mighty Everest. You will be warmly greeted by our representative at the Tribhuwan International Airport in Kathmandu upon your arrival. After escorting to your designated hotel in the city you’ll be assisted in checking into your room. Before checking in, the timing and location for a briefing session concerning your trip will be arranged. After such briefing, which will include a quick check of your personal trekking gears by our experts, you’ll have the afternoon/evening of that day all for yourself. In the morning after breakfast and preparation of the trek, the city guide will pick you up and then drive you to SWAYABUNATH stupa which is perched atop a hill on the western edge of Kathmandu valley. This is one of the world’s most glorious Buddhist Chaityas said to be 2,000 years old. After we drive 18 km east to an ancient palace of BHAKTAPUR filled with monuments, most terra-cotta with carved wood columns, palaces and temples. We end our day with a visit to Nepal’s most sacred Hindu shrine PASHUPATINATH. We will have some time to do last minute shopping before leaving for the trek. Our trek program commences today with an exciting 35 minutes mountain flight to Lukla (2,800 m) from where we start walking through the beautiful mountainous Sherpa land. Our nearly 5 hours walk today will reach us to village of Monjo (2,840 m). 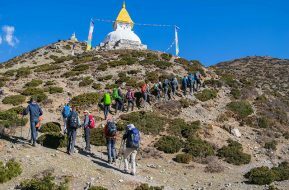 Walk will be through villages, community forest, crossing rivers on a metal suspension bridge with Kusum Kangru peak (6,367 m) towering at the backdrop; mani walls, chortens & boulders carved with Tibetan mantras and brightly painted prayer wheels. 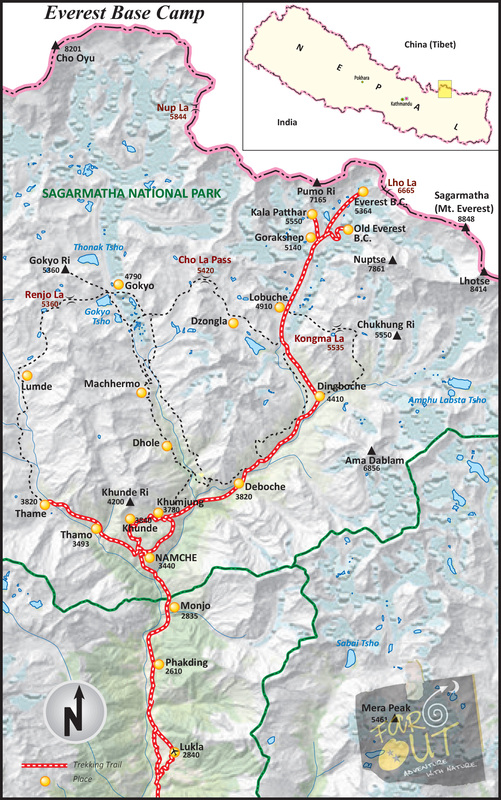 The walk today to Namche Bazaar (3,440 m) will comprise of around 4 hours. Initially the trail is gentle but gets you involved with high and long climbs at later stages actually taking you from a safe altitude to an area which can pose risks of altitude sickness. Hence, avoiding exhaustion by taking your time and moving slowly is advised. 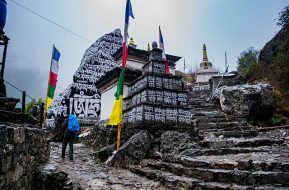 Trail passes through enormous granite bluff, carved with mantras in huge Tibetan characters, crosses Dudh Kosi river on a suspension bridge then walk through pine forest to famous Namche Bazaar for an overnight stay. Today is a rest day for acclimatization before proceeding towards higher elevation. 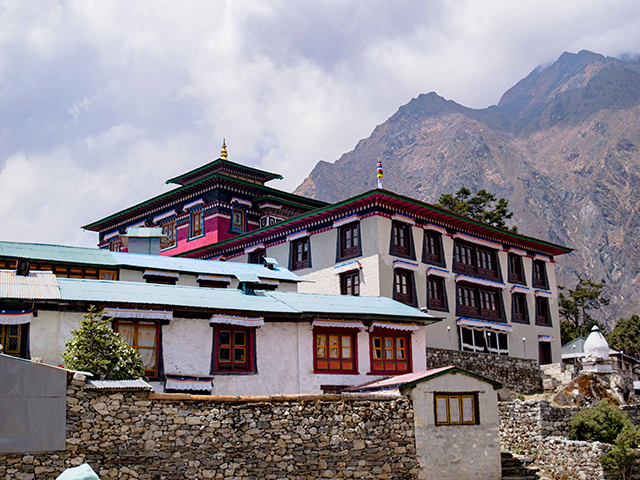 This day can be spent exploring the Namche Bazaar, Musuem, Sherpa Cultural Center and get some excellent view of the Himalayas. 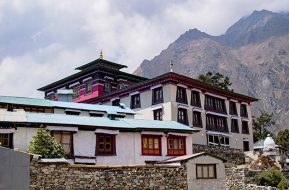 Also the option is doing a day hike to some large Sherpa villages of Kunde and Khumjung from where you can get the great views of mighty Everest. Overnight in the lodge. After breakfast, we climb towards the east following the Dudh Kosi (river) again, high above the riverbed. 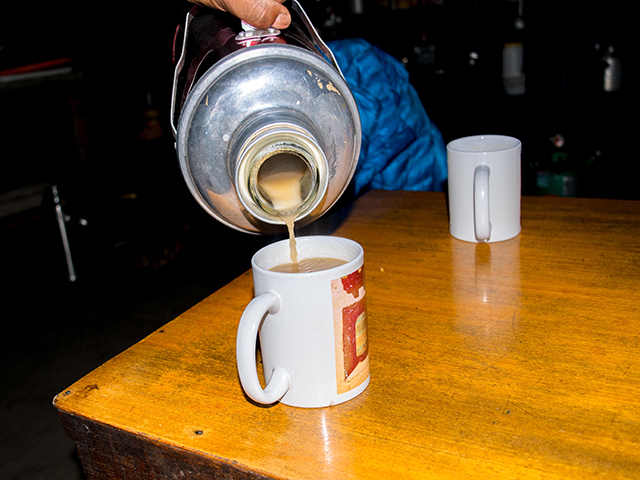 Then our trek descends to Phunki Tenga at 3,250 passing through some Sherpa villages like Sanasa and Tashinga. 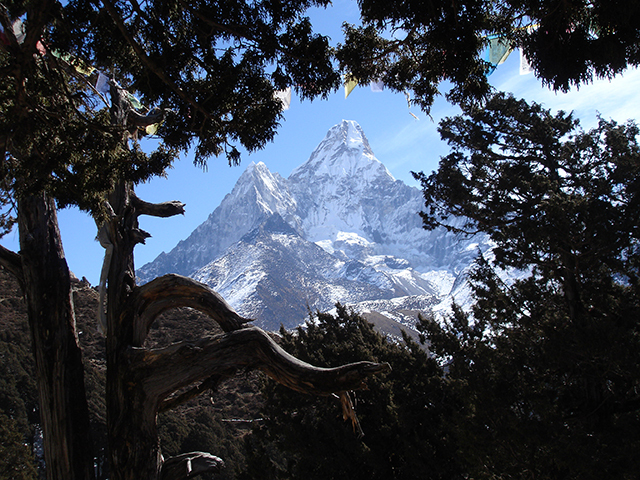 After, we climb steeply then walk through rhododendrons and conifers forest to Tyangboche at 3,870m. Here you will be rewarded with panoramic view of Mt. Everest, Lhotse, Nuptse and Ama Dablam. 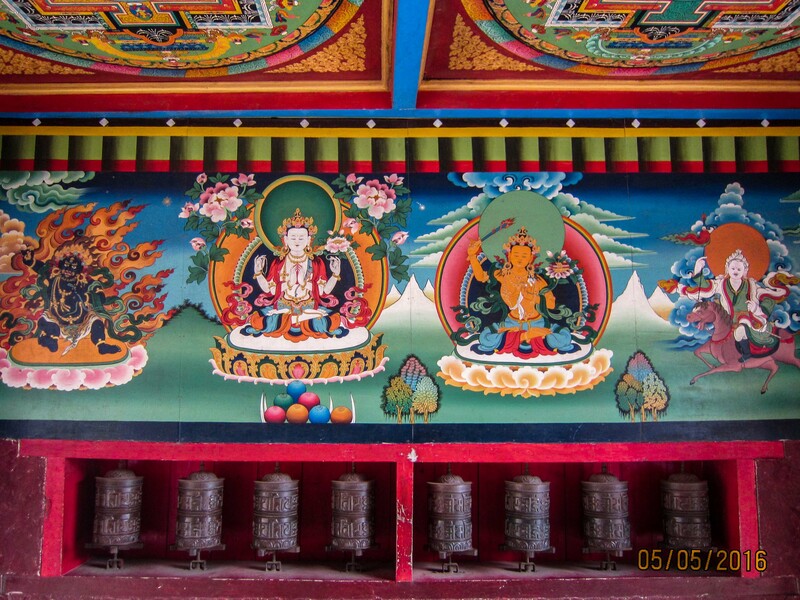 Also here you will have a chance to visit one of most famous Tyangboche Monastery. 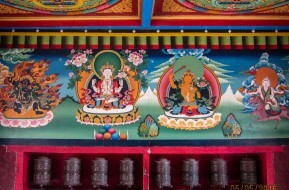 This is one of the most sacred monastery for the Sherpa community. After, we will descend down bit further to Debuche for our overnight stay. Today we follow the trail which goes through dense rhododendron forest then we cross the suspension bridge hanging above Imja Khola. After the trail climbs to Pangboche through mani wall and white stupa. 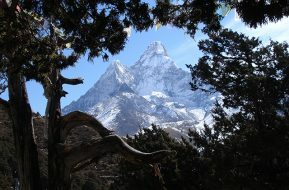 From the trail, you can have a great view of the Ama Dablam mountain. Continue following the trail of the Imja Khola past an enormous mural of Guru Rinpoche to the small Sherpa village of Shomare for lunch break. 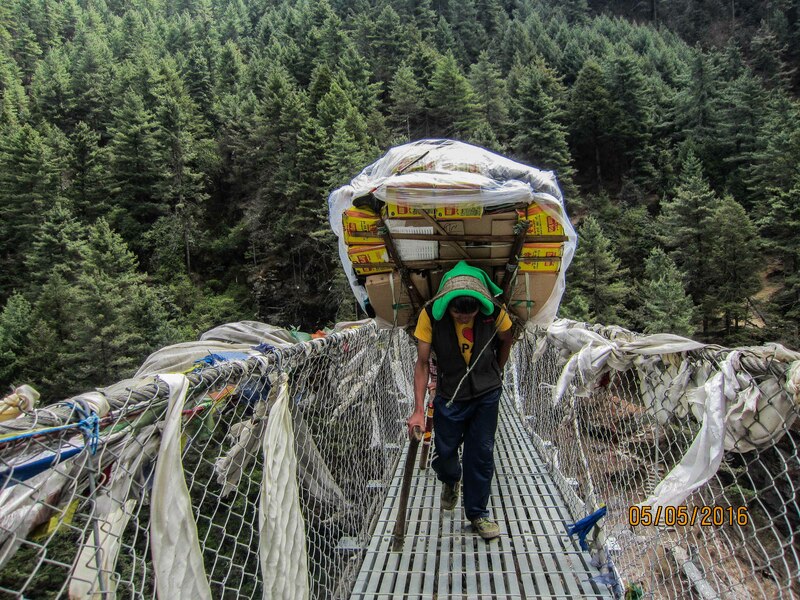 Then we walk very gradually for couple of hours gaining altitude to quaint traditional Sherpa village of Dingboche. 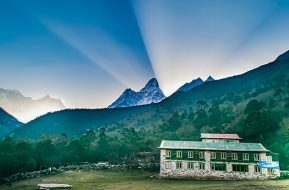 From here you can have a great view of Lhotse, Island Peak and Ama Dablam mountains. 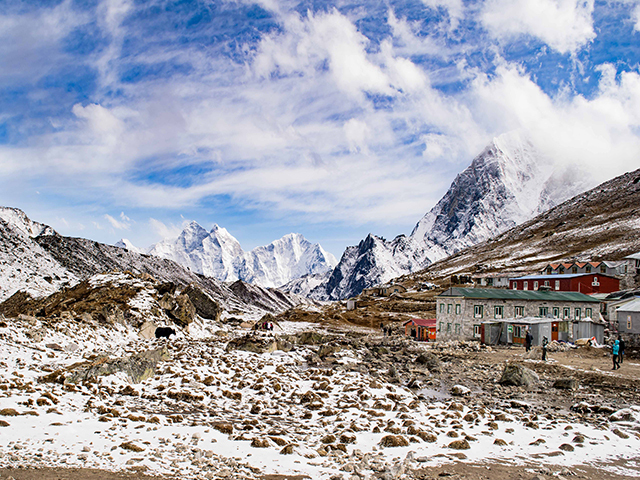 By now your body has been quite acclimatized, yet it is always a good idea to spend another night at Dingboche. This will prepare you considerably for a climb to a higher elevation. So today we visit a small summer settlement called Chhukung (4,730 m) with an option open for climbing up the Chhukung Ri (5,800 m). Once atop the Chhukung Ri, you can have magnificent views of the Island Peak (6,189 m), towers of Mt. Lhotse above the north, Amphu Laptse Pass (5,780 m) flanked by the immense ice walls dominating views towards the south. On our way to Lobuje (4,930 m) today, we come across magnificent views of Tawachee and Cholatse (6440 m). Lobuje which is a summer village boasts several hotels and its trail is reported to be the habitat of the snow leopard and the renowned “Yeti”. For nearly an hour the trail climbs straight up the rough terminal moraine of the Khumbu Glacier covered with parched and desolate surroundings with fingers of ice and snow dropping down sheer mountain walls on all sides. The area has rows of stone monuments built in memory of Sherpas who died in an avalanche during the 1970 Japanese skiing expedition on Everest including BabuChhiri Sherpa (10 times Everest summitter) & Scott Fisher who died in 1996 Everest disaster. While crossing the ridge from here, you will have a great view of the Pumori peak (7,165 m) before continuing our climb up to the north over loose moraine and finally arriving at Lobuje. It’s going to be quite an ordeal today, in terms of both mental and physical exhaustion, as we further climb towards higher altitude. But don’t you fret already, because while walking through the ‘off beaten’ trail via the Italian Project, you will be pleasantly rewarded with fantastic views of the Khumbu glaciers, Mt. Pumori (7,400 m), Lola and Link Tring(Tibetan mountains), Nuptse and the mighty Mt. Everest. Upon arriving at Gorak Shep around lunch time, you will have nearly 3 hours break. After enjoying your lunch you will gradually start your climb to Kala Patthar (5,545 m). Once atop, you can then watch awesome views of the sunset unfolding over the Himalayas, which momentarily will make you feel like you’re actually in Heaven. The view of course is subject to weather conditions. Overnight in the lodge. Today after breakfast we trek to the base camp (5,360 m) of the world highest mountain Mt. Everest (8,848 m). Start from the north end of Gorak Shep, than follow the trail across the Khumbu Glacier where you’ll see numerous prayers flags wedged between rocks at the bottom of the Khumbu Icefall (5,340 m). In comparison to your ascent to Kala Patthar you had the previous day; the trek to the Everest Base Camp is not going to be anything spectacular - landscapes, close up views of Khumbu Ice Falls, Khumbu Glacier and the base camp of highest peak are the main sight of this trip. In the spring time you’ll be greeted with an atmosphere which is fascinating in itself. 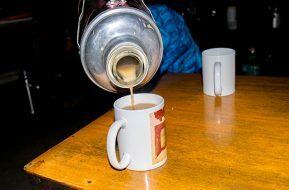 You’ll see climber groups from various countries eating, reading, playing cards, strumming guitars and doing everything possible to kill their time while they wait for the green signal to commence their climb to the summit. Return back to Gorak Shep pick up gears and then walk down to Lobuje for an overnight stay. 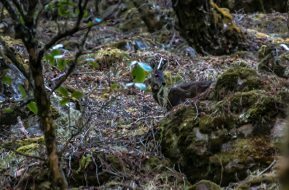 Today we retreat back the same route down to Debuche, through moraine, gushing stream, following the west bank of Imja Khola and through rhododendron forest to Debuche. As we will be retracing towards the lower altitude so we cover more ground. Overnight in the lodge. 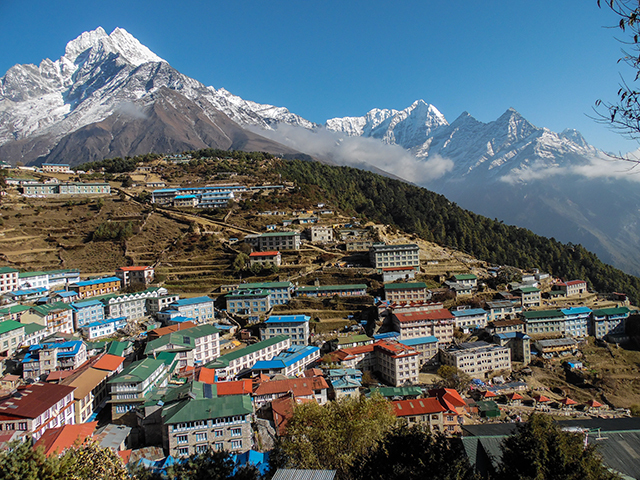 Continue retracing back by walking down to Phunki Thenga then climb the ridge towards Namche Bazaar. From here we descent down to Dudh Kosi which is quite hard as it gives lot of pressure to your knees. Cross high suspension bridge then the path runs mostly level to Jorsale and then climbs to Monjo. Overnight in the lodge. Today is the last day of our walk down to Lukla. The trail goes down the valley then passes through villages of Phakding and Chopling to reach Chaumrikharka. After we begin the final climb of the trip to Lukla for an overnight stay. After breakfast we fly to Kathmandu. We will receive you at the airport and transfer you to your hotel once again. Overnight in the Hotel. You have this day all for yourself to do your leisurely activities. You may shop around for souvenirs, get body/feet massage, take a walk to the nearby areas around the vicinity of Kathmandu valley or just wake up late and laze around in your hotel room. Also this day will act like a layover day in case of flight cancellation etc. Overnight in a hotel. After breakfast we will transfer you to the airport as per your international flight schedule and bid farewell. Includes: Breakfast & airport transfer. 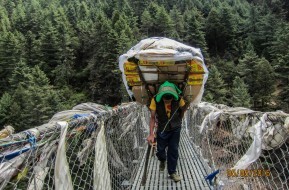 12 nights/13 days Everest base camp trek with Crew & porter support, simple accommodation on twin sharing basis and hot water bag above 4000 m.
01 day sightseeing tour of Swayambunath, Bhaktapur, Pashupatinath with local English speaking guide, private transportation and entrance fee during the sightseeing tour. Following are the equipment list for Everest Base Camp trek. This list is just a guideline but you can adjust it according to your needs and interests. Most of the listed gears can be hire or purchase in Kathmandu. You can find various qualities of trekking gears in Kathmandu market some are locally manufactured whereas the other are imported from China and are obviously of better quality. Also you can get high quality gears in some of the branded stores in Kathmandu. 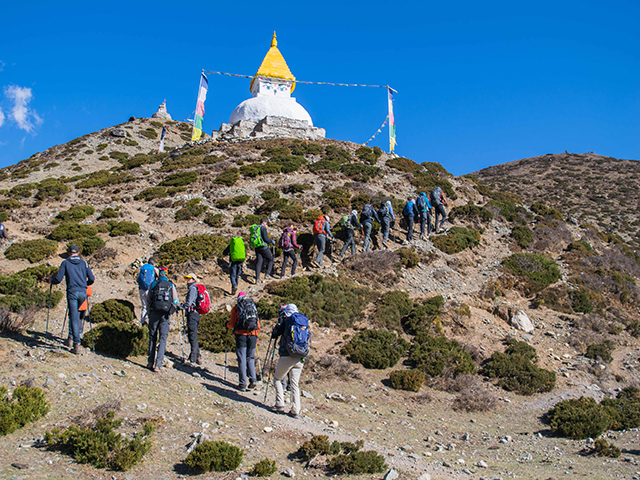 For your information that at the start of the trek, apart from your day pack, your luggage will be carried by a porter – so the weight of the bag should not exceed 15 kg per person. Glacier glasses 100% UV protection with side shields and a hard – sided storage case. This is to protect your eyes from the stronger rays of the sun due to the thinner atmosphere which can cause a painful condition known as snow blindness. Regular sunglasses are not sufficient. If you wear prescription glasses, speak to your doctor about prescription glacier glasses, perhaps with transitional lenses. 1 pair liner gloves thin wool or synthetic, useful alone on mild day or as a layer inside other gloves/mitts for additional warmth. 1 pair shell gloves or mitts Gore-Tex is preferred for keeping hands dry. 1 pair trekking pants. Waterproof/breathable, gore Tex or equivalent is best. 1 pair of hiking gaiters, good for keeping dust and rocks out of your shoes/boots as well as keep your feet dry. 1 small personal sized first-aid kit with blister treatments such as mole skin, band aid, some waterproof tape, anti-infection ointments, etc. Toiletry kit. Be sure to include hand wipes, liquid hand sanitizer & towel. Digital cameras but you must keep the batteries warm when not in use. 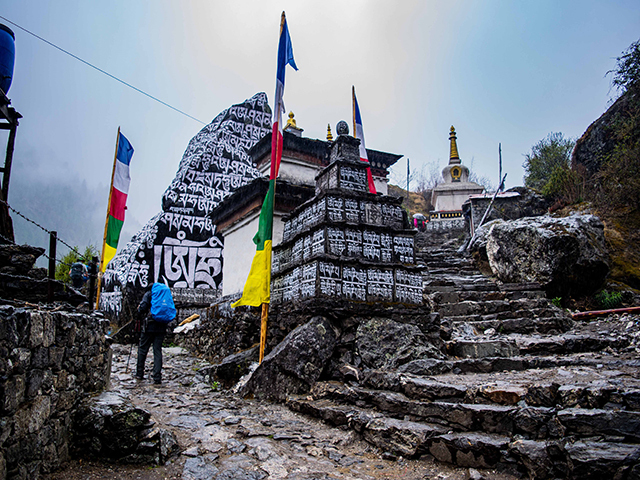 Boulders Carved With Black and White Tibetan Mantras, and brightly painted prayer wheels.